If you walk down the Crum’s Bartram path, you see a familiar sight – two stone slabs on either side announce your arrival at Crumhenge. But Crumhenge, the peculiar arrangement of slabs that has baffled generations of students, is gone. 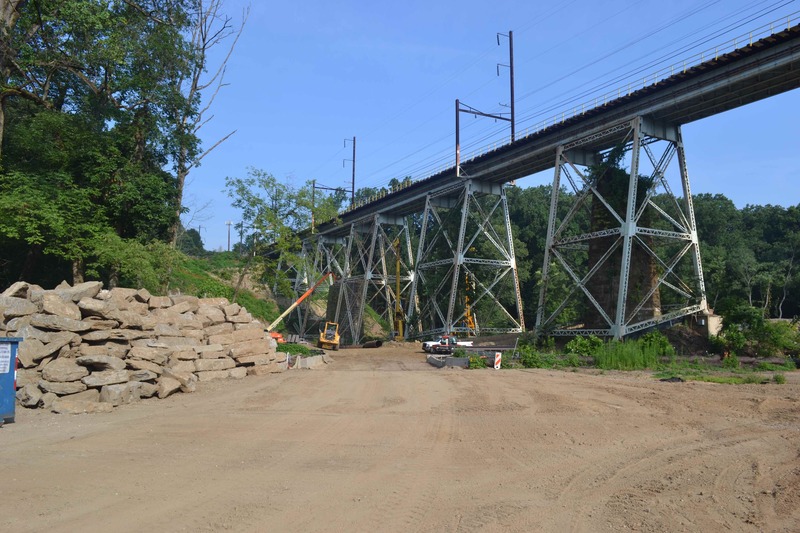 In its place are piles of dirt covered in weeds, muscular SUV’s, and a bustling lay-down area that forms the nucleus of a two-year, $90 million project to replace SEPTA’s bridge over the Crum Creek. The bridge is scheduled to be open by Labor Day 2016, according to SEPTA. While the slabs of Crumhenge lie under a shade tree, waiting to eventually be put back, the College plans, and negotiates, for what will happen once the construction crews leave and restoration begins. Trestle and Crumhenge area before construction. Photo courtesy of swarthmore.edu. Although SEPTA had the legal “right of way” to begin the construction on the viaduct replacement, they needed access to an additional plot of College-owned land adjacent to the site, said Jeff Jabco, director of grounds. SEPTA could have gained access to the land through the courts, but chose to negotiate with the college. Even while negotiating, SEPTA has filed a “court taking.” This means that a court has given SEPTA the power to use land without the college’s consent. Hain said the court hasn’t imposed anything on the college directly, but SEPTA could ask the court to do so at any point. ”They could go into the court any time and tell us: ‘No we don’t want to listen to you anymore, we’re just gonna do it,’” Hain said. Jabco said that filing in court was necessary to speed the construction process along. “Negotiating everything was going to take a while, because they didn’t have all the construction documents finished […], but they had to go through this procedure to use our land, and we were perfectly fine with that,” he said. The area during construction. Photo by Eduard Saakashvili ’17/The Daily Gazette. The project’s history goes back to 2010, when then-governor Ed Rendell stood under the Crum bridge, advocating for increased infrastructure spending, specifically for a new bridge. As the plan waded its way through the Pennsylvania legislature and approached implementation, SEPTA came to Swarthmore to start discussing the project’s logistics. “We pride ourselves in being good neighbors and working collaboratively with the communities in which we provide service,” wrote a SEPTA spokesperson. Negotiations had college administrators, lawyers in tow, talking to SEPTA directly. Though Hain and Jabco informed the Crum Woods Stewardship Committee of what was happening, the committee had no direct input, said committee co-chair Professor Jose-Luis Machado. Early on, the college and SEPTA discussed how crews would access the site. The College suggested building a road that would come down by the bridge from the Blue Route highway directly, using existing access routes, but SEPTA rejected the idea. Rolli said that the differences on road construction came down to differing priorities. “Our concern was that we wanted to cut down as few trees as possible. […] SEPTA had other concerns, basically,” Rolli said. To get to the site, construction crews had to build a road, clear Crumhenge, and cut down dozens of trees in the process. Contractors turned some of the trees into woodchips to use on site, while usable lumber was sold to a mill in Lebanon, PA, according to a SEPTA spokesperson. Sign marking the blocked-off area of construction. Photo by Eduard Saakashvili ’17/The Daily Gazette. Now that construction crews have entered the Crum, the crux of the negotiations has shifted to remedying the ecosystem damage done by the project. Natural Lands Trust, a consulting firm, will survey the damage and assign a monetary figure for compensation, which SEPTA will pay to the college, Rolli said. However, there is little precedent for quantifying the damage done to a site under a temporary-take construction project like this one, where a governmental agency borrows private land for construction rather than seizing it. “Natural Lands Trust, who prepared our document about it, didn’t have much to go on, like previous examples of data about what to do for ecosystem losses, especially in this temporary-take situation,” Rolli explained. Currently, the survey is taking into account factors such as number of trees lost, the quality of the trees, and whether they were exotic invasive trees or natives, Hain said. Hain said that SEPTA agreed to restore the land to its “natural state.” It’s up to Natural Lands Trust to determine what that means, and the college hopes to get the most out of the deal. “We’re trying to get them to restore the land to at least [its natural state], probably better than that,” Hain said. While future restoration will try to undo damage to the crum, much of what Rolli does is preventing damage. He patrols the woods regularly, making sure the crew doesn’t go beyond its agreed-upon limits of disturbance. Still, there has been a single incursion into an ecological research site. Additionally, the construction process has damaged the sensitive Oxbow wetland under the bridge. Though the crew didn’t physically reach into the wetland, Hain said the damage is “severe.” Jabco said he wasn’t too worried, however, since wetlands can be restored. “People create new wetlands all the time, because we’ve destroyed so many over time. So it is realistic to think that yeah, they can come back.” Jabco said. To work in the Crum, SEPTA had to get permits from a variety of organizations, including the Army Corps of Engineers and the Delaware County Soil Conservation District. Jabco said SEPTA’s disruptive work around Oxbow, too, is legally permitted. “They didn’t do anything they weren’t supposed to do. We’re just going to have to do with being sad about it for a couple of years,” Rolli said. For students, the most noticeable consequence will probably be the temporary disappearance of Crumhenge, where students have held everything from bonfires to theater performances and LARP events. More than anyone else, Crumhenge’s disappearance affected ΠΡ (Pi Rho), the student-run club whose sole focus is organizing bonfires. With Crumhenge gone, there is no officially sanctioned place to hold bonfires on campus. The slabs of Crumhenge. Photo by Eduard Saakashvili ’17/The Daily Gazette. Pi Rho first caught wind of Crumhenge’s dismantling as they were organizing their last Spring 2015 bonfire. “We were scheduling a bonfire for that semester and [Jeff Jabco] mentioned to me that we would not probably be able to do it this semester. […] It was actually the day before our last bonfire, so it was a bit of a surprise,” Pi Rho board member Emma Remsberg ‘17 said. Jabco promised to find an alternative location, but the search is still ongoing. Pi Rho’s Aaron Kroeber ‘16 said the administration wasn’t originally planning to find an alternative bonfire location, but changed course at the group’s prompting. “It’s only since we’ve kind of leaned on them a little bit that they’ve been [planning an alternative location], but since then they’ve been amenable,” Kroeber said. Rolli said the college has considered creating a space for bonfires just outside the construction site, in Crum Meadow. But, proximity to the construction site comes with its dangers. Also, Jabco would need to clear any proposed place with SEPTA, according to Remsberg. “[Jabco] said one of the issues is that people who go to bonfires tend to consume alcohol, and you don’t want them near a construction site,” Remsberg said. Jabco said that the school will try creating an alternative bonfire space, but that the college could reverse that decision at any point. “If we do find out that students can’t respect the fenced boundaries and are getting over in the construction area, then we’re just going to have to stop bonfires down in the woods at all, until the project’s all finished,” Jabco said. While Pi Rho mourns Crumhenge’s temporary demise, Kroeber expressed optimism about the club’s future. “It’s sad that Crumhenge is gone, but, you know – gotta keep burnin’,” Kroeber said. Recruited last Spring, Crum Woods Restoration Assistant Mike Rolli is a temporary hire. His main tasks are to monitor the construction site, but he also keeps the woods clean, removes weeds, and generally maintains the Crum. In the age of concerns about administrative bloat, Rolli is a rarity – after more than a decade of the Crum Woods Stewardship Committee pressing for someone like him, the college finally hired him on a short-term contract. In recent memory, Rolli is the first college employee whose sole responsibility is the Crum Woods. Rolli’s position, or its equivalent, was imagined long before the bridge project, in the Stewardship Committee’s 2004 final report, the most recent report of its kind. “My job description is basically outlined by what was written for the proposed Crum Woods [Manager] position,” Rolli said. Mike Rolli taking a ride in the Crum. Photo by Eduard Saakashvili ’17/The Daily Gazette. It’s still unclear whether Rolli will stay at Swarthmore after the construction project ends. While the college is fronting Rolli’s salary out of its capital budget, it plans to reimburse itself out of what SEPTA pays for restoration. Rolli’s contract expires in two years, and while the college likes the idea of a Crum Woods manager, it hasn’t decided whether he’ll get an offer to stay after that. “We’re not at that point yet, maybe in the future,” Jabco said. “It depends on how good this article is, I guess,” Rolli said. More information on the project can be found on SEPTA’s official website.